Kingston, a city, port of entry, and the capital of Frontenac co., Ontario, Canada, situated at the head of the St. Lawrence river, where it issues from Lake Ontario, and at the mouth of Cataraqui creek, 175 m. W. S. W. of Montreal, and 150 m. E. by N. of Toronto; pop. in 1844, 6,840; in 1861, 13,743; in 1871, 12,407. The apparent decrease is due to the removal of the garrison. The city is regularly laid out, the streets crossing each other at right angles. Most of the houses are built of blue limestone, which is quarried in the vicinity. Water is supplied partly from the river and partly from wells, some of which are impregnated with mineral substances, and the city is lighted with gas. 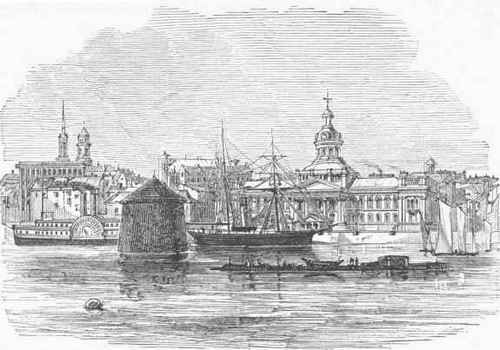 There are many fine public buildings, among which are the city hall and market, the custom house, the court house and jail, the post office, and the mechanics' institute. The Grand Trunk railway passes within 2 m. of the city, and a freight branch extends to the harbor. A railway is in course of construction to Pembroke, 120 m. N. The harbor is deep and commodious, and is protected by Wolfe and Garden islands, which lie opposite the city at a distance of 3 m.
On the west is the entrance to the bay of Quinte, and on the east the terminus of the Rideau canal, which connects the port with Ottawa. Haldimand cove, E. of the city, between Point Frederick or Navy Point and Point Henry, forms a deep and well sheltered haven. On both these promontories there are fortifications which command the whole harbor. Fort Henry is the principal work of defence; there are several martello towers near it, and as a military post Kingston is the strongest place in Canada after Quebec and Halifax. Steamers ply to Cape Vincent, N. Y., on the opposite bank of the St. Lawrence. The number of vessels entered from the United States for the year ending June 30, 1873, was 2,009, with an aggregate tonnage of 380,665; cleared for the United States, 1,655 vessels of 269,299 tons. The value of imports was $8,978,459; of exports, $1,358,202, making Kingston the second port of the province in the value of foreign commerce. Ship building and boat building are largely carried on, and there is a marine railway for repairing vessels. The other principal manufactures are of iron castings, mill machinery, steam engines, locomotives, leather, soap and candles, boots and shoes, wooden ware, brooms, pianos, ale and beer, etc. There are three branch banks, and a loan and trust company. Kingston is divided into seven wards, is governed by a mayor, board of aldermen, and common council, and has a fire department and a police force. Among the charitable institutions are the house of industry, orphans' home, general hospital, IIotel-Dieu hospital and orphan asylum, and house of refuge. The provincial penitentiary is about a mile W. of the city, and beyond the penitentiary is the Rockwood lunatic asylum. It is the seat of Queen's university and college (Presbyterian), with seven professors, and having an observatory connected with it; of Regi-opolis college (Roman Catholic); and of a medical college, with 11 professors. There are 10 academies and schools, a diocesan library, two daily and two weekly newspapers, and 17 churches, including the Roman Catholic cathedral. - Kingston is one of the oldest places in Ontario. A settlement was begun here by the French as early as 1672, under the name of Fort Cataraqui, which was subsequently changed to Fort Frontenac. The fort was destroyed by an expedition under Col. Bradstreet in 1758, and in 1762 the place fell into the hands of the British, from whom it received its present name. It became a city in 1838, and from 1841 to 1844 was the capital of Canada. Kingston, a maritime city and the capital of the island of Jamaica, in the county of Surrey, on the S. coast, 12 m. E. N. E. of Spanish Town, the former capital; lat. 18° N., lon. 76° 50' W.; pop. about 35,000. It is situated on the gentle slope of a branch of the Blue mountains, and stands on the N. shore of a magnificent bay defended by two forts. It is built in the form of an amphitheatre, with wide and regular streets; the houses, mostly of two stories, are solidly constructed of brick or wood, and painted green and white. The houses in the centre of the city form blocks or squares, and in the principal streets are furnished with verandas below and covered galleries above; while those in the outskirts are detached, and surrounded by delightful gardens. Besides the English church, the handsomest in the town, there are a Scottish, some Methodist, and several Roman Catholic churches, and two synagogues; but neither these nor the other public edifices, such as the theatre, hospital, courthouse, new penitentiary, workhouse, commercial subscription rooms, barracks, and jail, possess any architectural beauty. The bay or roadstead has a mean depth of six fathoms, and affords good mooring ground for 1,000 vessels of any size. It is bounded S. by a long and narrow strip of land named the Palisades, on the extreme point of which stands Port Royal, the naval station; but the entrance is considerably narrowed by a sand bank stretching in front of Fort Augusta, and the shelter is imperfect, owing to the lowness of the coast. The environs are covered with line sugar plantations, interspersed with picturesque villas. The region to the west is extremely marshy, and to the east rises Long mountain. The climate is hot, and generally unhealthy for Europeans; the thermometer ranges from 70° to 95°; but alternate sea and land breezes in the morning and evening temper in a measure the almost suffocating atmosphere. 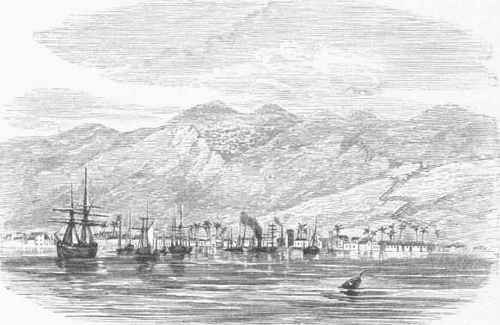 The situation of Kingston, between Europe and the centre of the American continent, has rendered it an important commercial entrepot. The chief exports are coffee, sugar, tobacco, dyewood, and its highly esteemed rum; and the imports mainly consist of manufactured goods, flour, wine, ale, and salted meat. The total value of the exports for the year ending Sept. 30, 1870, was $6,315,813; of the imports, $6,600,-146. It is connected by rail with Spanish Town. - Kingston was founded in 1693, after the destruction by earthquake of Port Royal; it was made a bishopric in 1856. In February, 1782, the town was almost completely destroyed by fire; and another disastrous fire which commenced on March 29, 1862, and in which a few persons perished, destroyed property to the value of $1,250,000. Yellow fever has at times committed fearful ravages here; and about one eighth of the population was carried off by cholera in 1850.